How to Wear Shimmery Winter Eye Makeup - mehreen - Blog. Winter parties are the perfect excuse to experiment with playful makeup textures. This is the season associated with particularly glitzy makeup. Don't be afraid to experiment with something you normally wouldn't even consider. Here is one look you can try that is simple enough to recreate on your own. It does not make use of advanced contouring techniques. Don't be fooled, though. You will literally light up a room the instant you walk in. Apply foundation and eye makeup primer on clean, oil-free lids. Groom and define eyebrows. As you are not making use of much color here, a flawless brow is vital to the overall effect of your look. Brows free from strays and scraggly too-long hairs frame the eyes and face beautifully. Enhance the shape of brows and fill in sparse areas with either a brow pencil or powder. 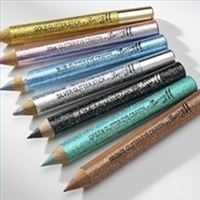 Glide a creamy glitter eye pencil in silver (for fair complexions) or gold (for darker complexions) over lids from lash line to past the crease. Run the pencil over lower lash lines as well. Pat over areas where the product may be a little uneven. You want a pencil with flecks that are very fine and minute for a look that isn't tacky. Define top lash lines. You can do this in one of two ways. Older women might want to use a black liquid eyeliner winged out at the edges for a classic touch of glamor. Teenage females, on the other hand, may want to keep a lighter look by using a glitter liquid eyeliner that matches the color on their lids. If you opt for the latter, pack on the density of the product. There should be an evident contrast between the lash lines and the rest of the eye. Curl eyelashes. You may apply a few coats of black mascara alone or put on a pair of false strip eyelashes. If you elect to wear the fake lashes, merge them with your own by following the steps on the Website located in our Resources section.